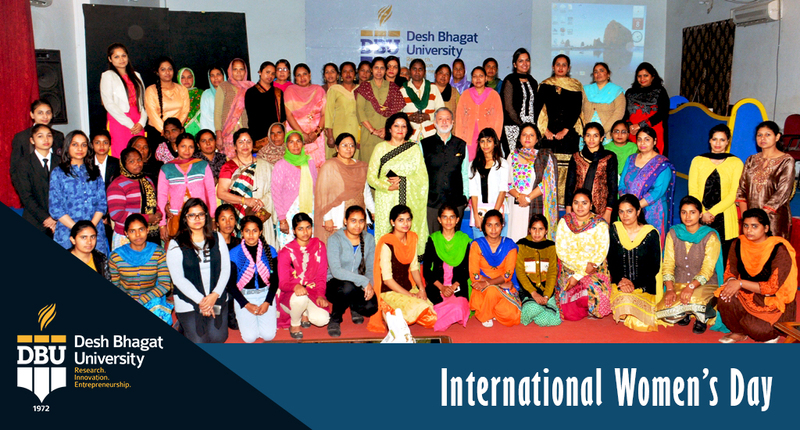 Desh Bhagat University will provide free education to its Class-lll and Class-IV employees and they will get one hour relaxation for their education, this declaration was made by University Pro Chancellor Dr. Tajinder Kaur, while presiding over the Women's Day function at the campus. She admitted that the thinking of society about women has changed a lot and they are much stronger than before but still there are several miles to go for their full empowerment. University Chancellor Dr. Zora Singh conveyed his best wishes to all the women employees of the university on this auspicious occasion. He said that we can't imagine a world without women and we must show maximum regard to them. During the event students and faculty members of different faculties participated with full enthusiasm. Vice Chancellor Dr. Varinder Singh said that women are contributing a lot in the progress of society and the country and it’s essential for the society to give full respect to the women and every kind of oppression must be stopped against them. Pro vice chancellor Dr. Tajinder Kaur said that the girls should get education and become aware of their rights, so that they can become self-reliant and make their contribution to the development of the country, he added. Faculty of education organised a Social Awareness Program and Tree Plantation Drive on this occasion. The motto of the program was to create awareness regarding crime against women, female foeticide, use of drugs and social evils. A cultural function was also organised, in which girl students performed items like Giddha, Songs, Play and recital of poems. Girl students who had performed excellently in the field of sports and academic were also honoured. Director Dr. Kulbhushan, Director Dr. Ramandeep Dhillon, Dr. Surjeet Patheja, HoD and staff members of different faculties were also present on this occasion.